6 Weeks 4 Days...Sure Looks Like 2 to Me! 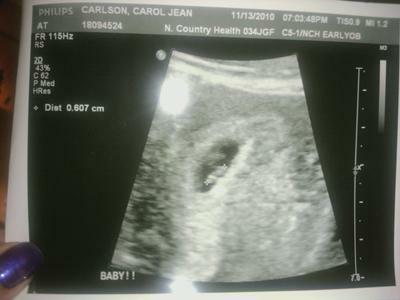 I was cramping so they did a US to check on baby..the ultrasound tech said its only one but after looking at the pic after the tech left it sure looks like 2 and everyone else says so too..i figure all of you are more knowledgeable in this matter and can tell me if the tech is wrong..the girl who did it was an OB tech. I even told her i had a feeling it was more than one and was hoping she would do a transvaginal one to get a better look because at my 6 wk scan with my last child she couldnt see anything doing the belly one..but she didnt bother..please tell me what you all think.. Comments for 6 Weeks 4 Days...Sure Looks Like 2 to Me! after seeing the pic i tried to wait until next appt but i couldnt i just had to know..i call the dr and his nurse goes back to the report and tells me that she dont understand the wording they are using so she'd talk to my doc and call me back..she says its a double decidual and one stopped forming and is already starting to dissolve n only one heart beat was fine..i have to wait 12 wks for another scan..but i wonder if maybe since US tech wasnt looking for one she didnt see it clearly..i asked her straight out when i was getting the scan if she thought twins cuz i was just having these feelings and my symptoms were worse, not only that but there are twins in both of our families..she straight up told me no theres just one...isnt it tru you arent going to necessarily see something that you arent looking for? obviously it was still there when they did the scan but she seemed to not even see it..she gave me a pic that she had put in the word "baby" on the bottom and you could clearly see two of em..i hope they are wrong i would love twins..
With my fraternals, you could see two black circles with something fuzzy inside each. On yours, I only see one black circle - so if there are two, they must be sharing a sac.